Milodon’s 45+ years experience of manufacturing oil pans truly shows! These oil pans fit and work better than any other we have tried. Low profile “triangulated” design was originally developed by Milodon over two decades ago and gives good ground clearance whilst providing adequate oil capacity for high performance use. Oil control baffles subdue oil movement and provide increased horsepower, features Milodon’s distinctive gold irridated finish. Designed for Small Block Chevrolet with right hand dipstick (near to sump) (1986 and later). Pan capacity 7 US Qts. 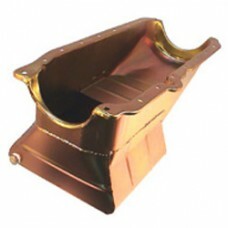 8 1/4-inch sump depth. Recommend pick up MIL18314.